The chronological discography that you can find by clicking Discography (above) is designed to satisfy the needs of both the serious collector as well as the casual listener. I also provide a page for information on early recordings. On another page I discuss Lehmann’s recordings in general. The numbers that follow “LP:” refer to the LP REFERENCE. At this time I don’t provide complete information on the contents of the many CD re-releases. A list of CDs may be found on the Recordings page. A word about original speeds of the “78s” recorded before 1931. The well-known discographer William Moran has pointed out the fact that no written record was kept of the speeds used in early recordings. “A deviation in speed of 4 revolutions per minute (rpm) changes the pitch (and thus the key) by one-half tone. Not only is the pitch incorrect…but…the tone and quality of the voice is distorted,” writes Mr. Moran in “Nellie Melba: A Contemporary Review.” Only the approximate range of speeds (“78’s” vary from 72 – 87 rpm) can be offered. The careful listener should compare the recording against the published key. (See the article by Andrew Walter at the end of the piece “Early Recording“.) Even the speed of re-released LPs isn’t always correct. With a variable speed turntable, one can find the key of the selection and adjust with the help of a piano, pitch-pipe or organ to bring the recording to the correct pitch. CDs re-releases have sometimes corrected this problem. The trouble with the suggestion of trying to correct the pitch at home is that Lehmann often transposed selections (less frequently with arias with orchestral accompaniment). Further, exact pitch is a recent phenomenon; pianos, organs, even orchestras played (and even now, play) at a wide variety of pitches. Any exact “pitching” of some of these recordings is difficult. This discography is based on that of Floris Juynboll which appeared in the March 1985 “Stimmen die um die Welt gingen” magazine. 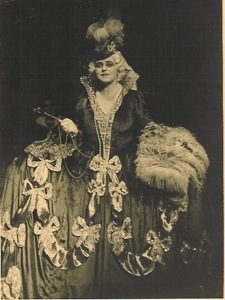 With the publication of “Lotte Lehmann, A Centenary Biography” by Alan Jefferson, Mr. Juynboll considerably altered and expanded his original publication (especially the commercial recordings). He doesn’t include much material in the “non-commercial” section, but I have often referred to his data (J.:) in both the “commercial” and “non-commercial” section. He sometimes contradicts himself and this has been noted “???”. In some listings there are two dates, one from my sources and another from Juynboll’s. Until I am more certain of the facts, I will let both stand. There is also the German language publication of Mr. Jefferson’s biography which has an even more recent Lehmann discography. Published by Schweizer Verlagshaus, Zürich in 1991, errors, typos and other discrepancies occur in this work as well as any, but when additions or corrections seemed warranted, they have also been included in the present discography. The Lehmann discography by H. P. Court, updated by Clyde Key was also helpful. Many thanks to the others who helped: William Moran, who gave me basic instruction and format advice as well as data; Alan Kelly, England; R. Peter Munves, of CBS; Edwin Matthias of the Library of Congress; Robert Kenselaar of the Rodgers & Hammerstein Archive; Elisa Schokoff of the Museum of Broadcasting; Jerry Minkoff, researcher and editor; Joseph Pearce and Harold Huber, private collectors; Manfred Miethe for the German proof-reading; Katsuumi Niwa, Frank Manhold, and Paul Glassman; Dixon Smith, computer aid; and Frances Holden, Dan Jacobson, Martin Silver, Jim Stenger, Judy Sutcliffe, and Christian Brun. Unless otherwise stated, all entries are sung in German. Let’s say that you’d like to know if Lehmann recorded Vissi d’arte from Puccini’s Tosca. Simply do a search for Vissi d’arte and you’ll see that there are several discography reference numbers (050, 149, 440 a, mc 515). You’ll find that Lehmann first recorded the aria in 1924 (050) for Odeon. The “mc” reference means a master class that Lehmann taught. After the index number, the first number given is the matrix number followed by the single-side, then the double-sided catalog numbers. These are all nominally “78” rpm or shellacs. (As I mentioned above the actual rpms may vary from 72 – 80). (Here’s more information on early recordings.). The LP number refers to the LP Reference Index. Just scroll to that portion of the LP Index where you can find the aria’s appearance on vinyl. CD references are not yet integrated into the complete discography. A list of CD re-releases can be found on the Recordings page. Index number 149 will lead you to another Lehmann Vissi d’arte recorded in 1929. Various companies’ catalogue numbers are listed after the matrix and Odeon number. Index number 440a lists a “non-commerical” recording of Vissi d’arte, taken from a radio broadcast in 1938. There is also an LP reference number. Still following the string of Vissi d’arte references will lead you to Index number mc 515 which indicates a master class recording. Here Lehmann teaches “Vissi d’arte” at Northwestern University in 1967. When no other location is mentioned at the end of such an entry, the recording can be heard at the Lehmann Archives at the University of California Santa Barbara.